With Orange is the New Black, Netflix has one of the most enjoyable and talented ensemble casts currently on the small screen. 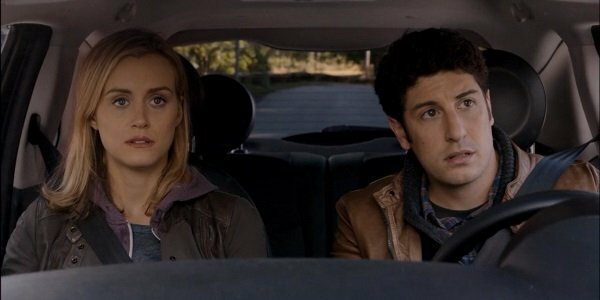 Unfortunately, the show will be losing another one of its characters by the time Season 3 rolls around, as Jason Biggs will not be back as Larry Bloom. Rather than having the announcement get filtered through Litchfield Penitentiary’s grapevine, Biggs shared his impending absence with New York Daily News, making it clear that it doesn’t mean he’s out of the show forever. They’re not focusing on Larry at the moment. Larry will not be in Season 3. But there’s always a possibility he can come back. If Orange is the New Black continues winning over Netflix subscribers and critics, it’s impossible to tell when or if this series will ever end. (I mean, the streaming service gave Hemlock Grove three seasons, and that wasn’t nearly as popular.) So it’s absolutely possible that by the time Season 4 gets here, creator Jenji Kohan and her writers might have another story avenue for Larry to fit into. If we’re being honest here, I just really want to see Sophia put her hair-styling talents to that mop on his head. Larry’s story was already getting watered down throughout Season 2, so his exodus isn’t all that surprising, really. In Season 1, he was Piper’s backbone outside of Litchfield, helping her and offering emotional support when needed. But she screwed all that up with constant cheating and lying, and he did some lying and manipulating of his own. Their shared arc in Season 2 basically saw them mad at each other, and Larry eventually entered into a relationship with Piper’s best friend Polly. (Who was also doing some cheating.) Maybe Larry’s dad will pop by and offer the audience an update. Biggs isn’t the only actor who won’t be returning. Pablo “Pornstache” Schreiber won’t be returning to gross anyone out, and Lorraine Toussaint won’t be reprising her role as the vicious Vee, but that’s because she got demolished by the prison van. Luckily, actors like Blair Brown and Mary Steenburgen will be there to bring new characters to this turbulent world. Biggs will soon be leading Lisa Addario and Joe Syracuse’s comedy Drive, She Said, and he’ll be hitting Broadway for the play The Heidi Chronicles, in which he’ll star opposite Elizabeth Moss. And we can probably expect American Early Retirement Party in the next five years or so. Orange is the New Black will return to Netflix for its Season 3 premiere this June.